3D printet Container on top of the position sender. The box is centered with a bolt in the bottom, fit the calibrator frame. 12 mm transducer with 8-10 m measurement distance. Turn on/off on the container. 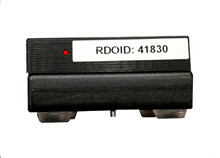 red blinking diode when operational. Slow with just power on, fast flashing when accepted on the radio.